We’ve got less than a month until Valentine’s Day and we are ready for the LOVE! Yup, this is Hannah, bringing you another card for Kat Scrappiness! I was snuggling my kiddo in bed one night, thinking about this card, and the next day I got to make it come true! How fun is that?!?!?! 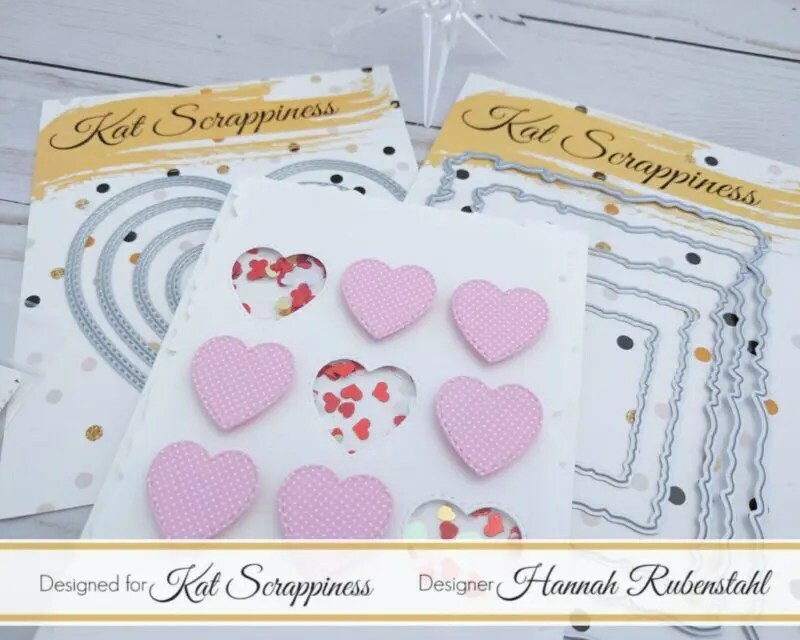 That is what I love about Kat Scrappiness, she’s got such a great and wide variety of products that I can make so many of my dream cards come true! I started with what has now become my FAVORITE rectangular die ever! I LOVE LOVE LOVE the Distressed Edge Rectangle Dies! I am using them all the time now! So I used the largest die out of the set and cut out a rectangle using Neenah Solar White Cardstock in an 80lb weight. I also cut out a second rectangle in order to do my measurements and notes and a third out of fun foam. I started by finding the center of both the verticle and horizontal points. 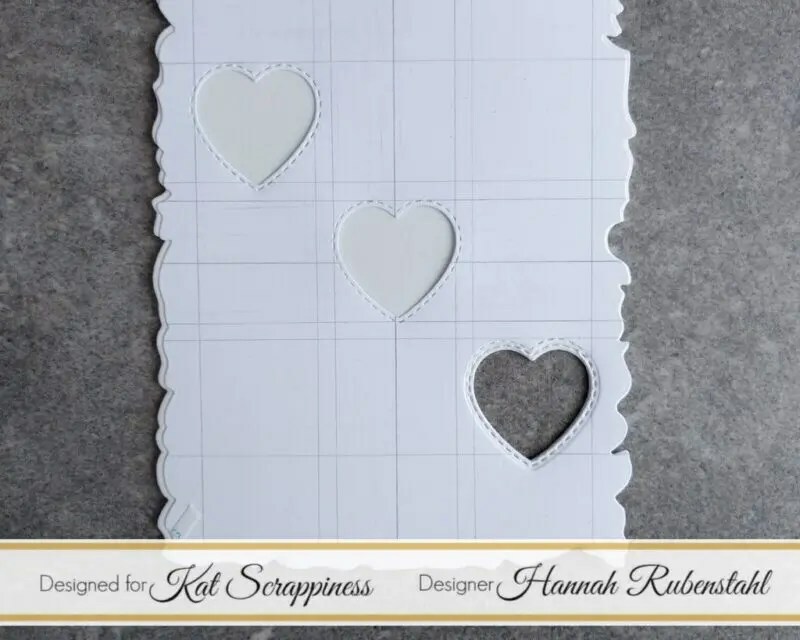 The smallest of the Double Stitched Hearts by Kat Scrappiness is roughly an inch square, so using a clear ruler I measured half an inch off of either side of the center lines. Because I needed space in between my hearts I measured a quarter of an inch on either side of those half inch lines. I know it sounds like a confusing mess, but take a look at my photo. Really, the important part was figuring out the center inch and making sure I could align the other 8 hearts around it. I die cut three hearts out of that panel using that Double Stitched Hearts die. Because this is a shaker card! I also cut 6 more hearts out of a pack of Doodlebug paper. On the backside of my Neenah panel taped on acetate using Scor-Tape. I went back to the fun foam panel, and die cut those same small hearts out using the scratch piece as a template, see the first photo. You can see how I cut out one heart but hadn’t cut the other two yet. Because fun foam can squish when it goes through a die cutting machine it squishes out and cuts a touch larger than you want, just a touch. For this reason, I almost always trim down the edges of my foam panels. I cut all four outside edges as well as the hearts. Are you reading this right? Each heart shakes separately! Using more Scor-Tape, I adhered this fun foam panel to my Neenah panel, and using MORE Scor-Tape I adhered that to my card base which is made of Neenah Solar White Cardstock in 110lb weight. While I was taping it on I carefully snuck my sequins underneath the acetate hearts as I was removing the Scor-Tape cover. The Hearts O’Plenty sequin pack is the PERFECT sequin mix for this card! Now that my card was almost completely built, I was able to add those hearts from the patterned cardstock. I popped them up from the panel using 3D Self-Adhesive Squares! 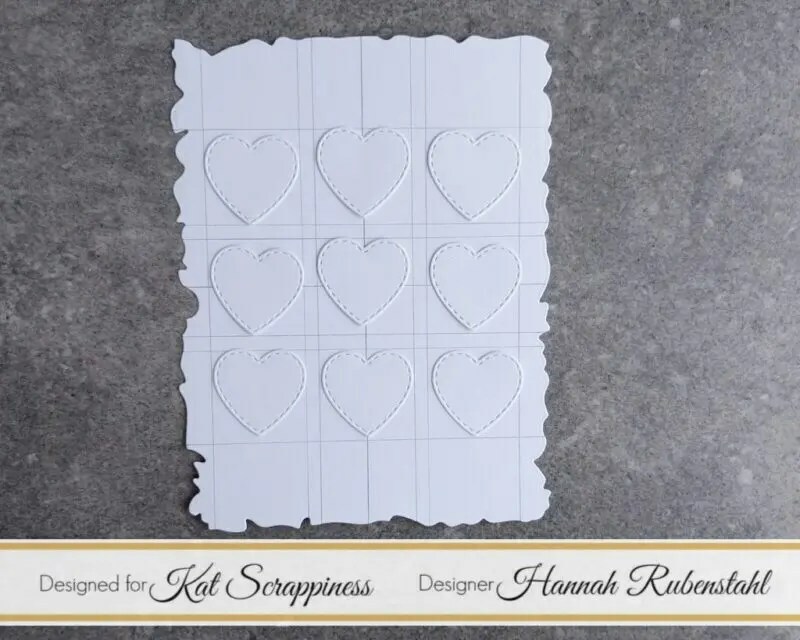 If you’re needing any of these items from the Kat Scrappiness store, or anything else, feel free to use HANNAH10 at checkout to save 10% off of your order!